Hello and welcome to my blog today. I hope everyone is happy and creating something fun!! Today I want to share my new/old crafting furniture I painted with Annie Sloan Chalk Paint in Paris Grey and Old White. I did one piece and now I am onto another addiction, Chalk Painting furniture. This is the easiest paint for furniture yet! I hope this small tutorial inspires you to try it out. This is my son's changing table and dresser, I use it for die cutting and holding my ribbons. In my new home I wanted to match everything so I could create in style, a must! lol This is my first attempt at using Annie Sloan Chalk Paints so I know fine tuning will be done in future paintings. After letting the 2 coats of Old White dry, I mixed 1Paris Grey small can with 2 cans of water and then stirring it until is is completely mixed. Here is the little container I mixed it in, a lot of this tiny paint can goes a long ways. After you add water it is then referred to as a wash.
After the Paris Grey wash is completely dry I used a fine sand paper block to rub off some of the Paris Grey paint to show the Old White paint. This is distressing it and I could have done a lot more but I did not want the original brown to show. 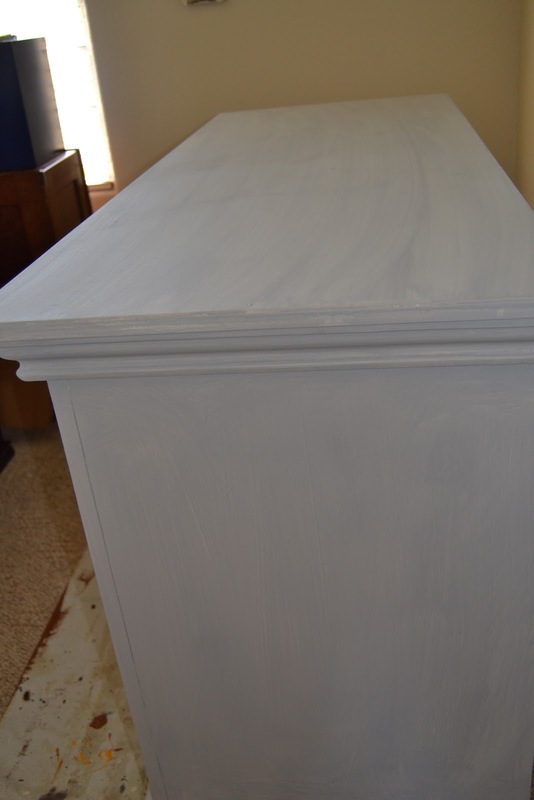 The next step is to apply soft wax to the dresser after you wipe the dust off from the sanding. 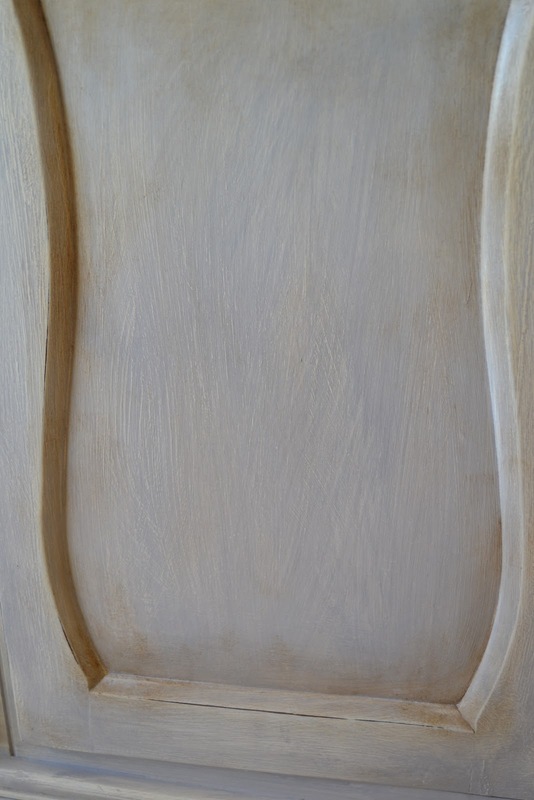 I took a stiff bristle paint brush to apply the wax and then wiped it off with a soft cloth. Make sure you take a small section at a time and brush on the wax, then wipe off the excess wax. You only apply a small amount of wax when you put it on and then use the cloth to get the majority of it off so the stickiness is gone. 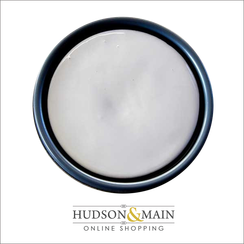 Do you see some of the texture and marbling of the paints now after apply clear wax? Before the soft wax dries the next step is I did was to apply the dark wax to the edges of the doors and sides of the cabinet. I took the Annie Sloan brush that I painted with (after washing it out) for the dark wax so I could get it into the crevices. It is important to have the clear wax moist on the surface first so it helps blend the dark wax. The dark wax helps age and distress your piece. 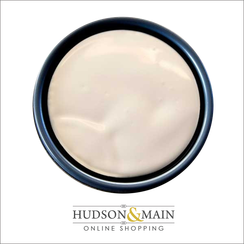 After applying the dark wax you need to rub it in and then off until you achieve the look you want. 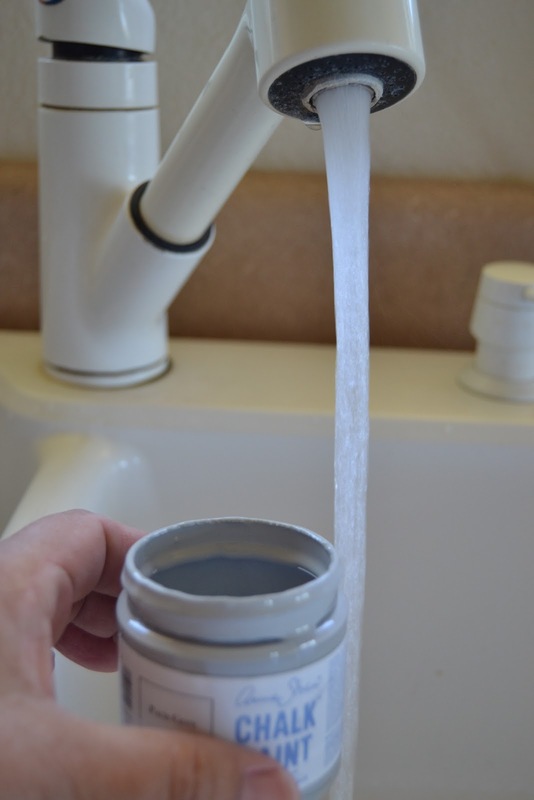 This can be done numerous times and if it gets too dry just add a tiny bit of clear wax to the area first. I let it completely dry overnight and rubbed the entire dresser with a clean soft cloth to polish the surface. It takes a while to cure and I recommend using the instruction sheet that goes with Annie Sloan Paints for each step. There is a lot of lines and color variation in my dresser but I did not distress this one very much, it appears more elegant to me. Because I use it to do my canvas painting too, I had a piece of glass made for the top to protect it from my own abuse. I also did a very old wooden file cabinet that sits right beside it. 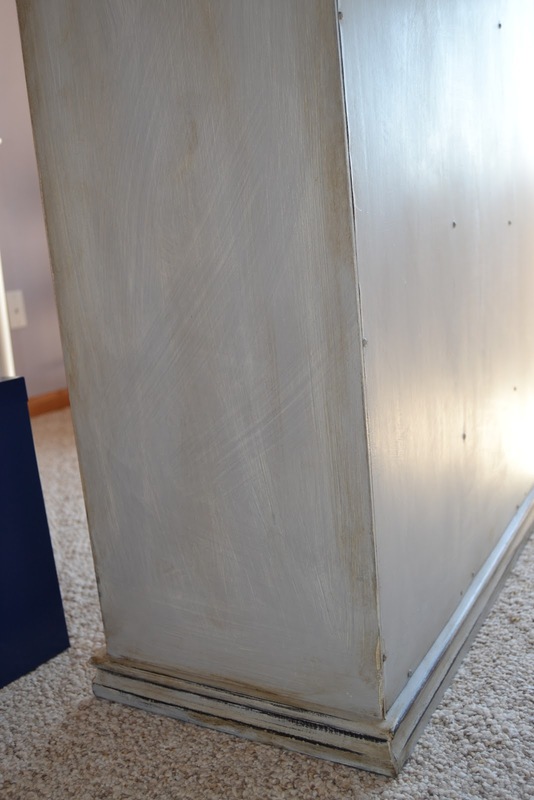 Here is the leg to my big craft table, this one is more distressed and was a challenge because it is not real wood and there is cardboard on the sides to paint. 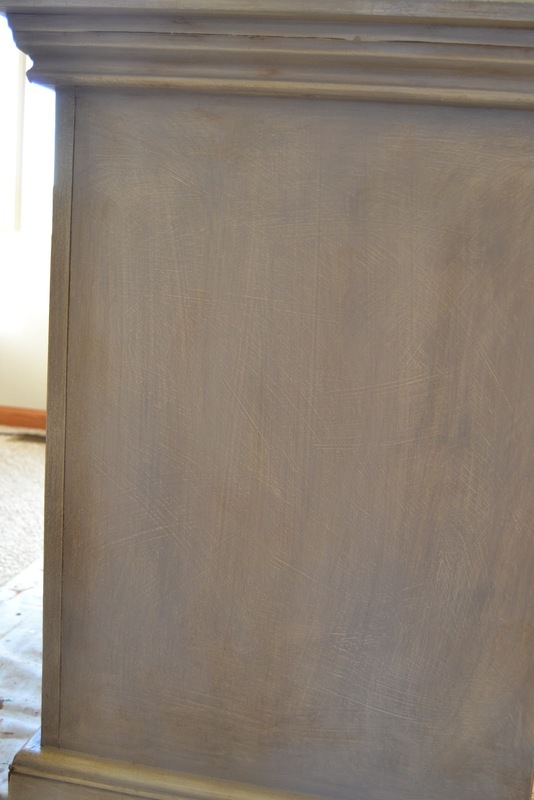 As you can see it looks just as good as the real wood furniture pieces I did, this Chalk Paint is amazing. The top and 1 side is not done as I ran out of paint and clear wax. I will finish it up when I return home from visiting my family in Minnesota. The piece will still look like this but I am applying more coats of clear wax to harden the top so I can color and embellish my things on this craft table without ruining the paint. Of course I cannot stop there so I am going to finish the other 2 pieces in my craft room next. After seeing the result of Chalk painting, I decided on the color lilac for my walls. Here is a better look at my desk and the unfinished parts of it. I love the light that comes into the room and that balances out the lilac on the wall with the grey crafting furniture. The navy drawers are metal so I will apply Annie Sloan Chalk Paint to that too, why not experiment and I will try a different color too, hmmm maybe Antoinette. Thank you for stopping by and I hoped you have learned something from my tutorial. I purchased my Annie Sloan paint from a local retailer but they also have a online shop Here at Hudson and Main. If you have any questions about this process the ladies at Hudson and Main will be happy to take you calls and help you with it. omg! I looooooooove this Kelly! looks absolutely gorgeous and worth all the work, and it must be fun! Very beautiful! Beautiful! You did a great job and craft room is gorgeous again! Wow... I'm impressed Kelly! You did a great job and I love it. I might even try that paint. Stunning craft room, Kelly! You did a phenomenal job!!! I am loving this chalky painted furniture, so lovely. Your craft room is such a delight! I so need to work on mine!!! Enjoy the weekend. Your furniture looks beautiful ! And I love the lilac paint on the walls! I am very impressed!!!! All so totally awesome! Your furniture looks fantastic along with the color of your walls. All so cozy and inspiring. Great light from your window and I'd love to sit at your desk and craft with you! I thought I left feedback already and sorry if this is a repeat. Brilliant work with the Annie Sloan paints - how amazing the transformation is, and wow, your work room is looking stunning!